Copyright: © 2015 Rustgi S, et al. This is an open-access article distributed under the terms of the Creative Commons Attribution License, which permits unrestricted use, distribution, and reproduction in any medium, provided the original author and source are credited. i) Breeding for imidazolinone tolerance: The decline in barley acreage can be in part explained by the large-scale application of IMI herbicides and adaptation of IMI-resistant crops. Making transfer of IMI-resistance, characterized by us in the feed barley cultivar Bob to other relevant food, feed and malting barleys a primary breeding objective . In this connection the seed grant received from the Wash. Grain Commission, allowed us to transfer IMI resistance to six barley cultivars two each belonging to three market classes of barley. The transfer of resistance was primarily confirmed by herbicide spray at a 2× (8 oz/acre) field recommended dose (for winter wheat) followed by determination of plant vigor a month after herbicide spray. Based on the phenotypic screen 6-8 most vigorous F2 plants per cross-combination were tested for mutant allele at the AHAS (acetohydroxy acid synthase) locus by DNA sequencing, and the recovery of recipient parent genome by genotyping with the carrier chromosome 6H specific DNA markers. Results of this pilot study revealed a range of 20-90% recovery of the recipient parent genome for the carrier chromosome in different cross combinations. Collectively, this study unambiguously showed that it is possible to identify plants with good recipient parent genome recovery without involving the laborious backcrossing steps . In view of these results we are now screening 192 F2 individuals per cross combination for the recovery of the recipient parent genome using a three step marker-assisted selection approach. This approach involves a foreground selection step followed by two background selection steps, which include sequential screening with carrier chromosome specific and genome-wide DNA markers. The plants showing good recovery of the recipient parent genome will be evaluated for their performance in field on herbicide residue and under spray trials. ii) Pre-breeding for the high grain lysine content: All cultivated barleys are lysine deficient, and require lysine fortification for feeding livestock. Thus, improving lysine content has always remained a primary breeding target. To cope with this problem the breeders have produced high-lysine barley mutants, but despite of several attempts, were unsuccessful in dissecting yield penalty associated with the only agronomically relevant high-lysine barley mutant Risø 1508 (Lys3a) with 44% more lysine than wild type. The possible reasons behind the unsuccessful attempts may be either the size of the primary mutation or its tight association with other undesirable background mutations. Moreover the miss-localization of the Lys3 locus on barley chromosome 5H made its cloning virtually impossible. With the help of our collaborators in Germany we determined that ~10 Mb DNA stretch from Risø 1508 on the short arm of chromosome 1H carries Lys3 gene. It is a big chromosome segment harboring several hundred genes . Thus, in order to narrow down the effect to a smaller chromosomal region with fewer genes, crosses were made between a near iso-genic line dubbed BW496 carrying the Lys3 mutant allele in the Bowman background with Golden Promise, and >2000 F2 grains were obtained. DNA markers flanking the region of interest will be used to evaluate these F2 plants to identify genotypes carrying recombinations within this region. Identified recombinants will be genotypes with additional DNA markers mapping within the region . If required more DNA markers will be developed and more crosses will be made, and the process will be repeated until a limited number of candidate genes will be identified whose effect on the lysine content will be confirmed by gene silencing. iii) Breeding for root and crown rot resistance: The aim of this research is to address a gap in genetic resources available to barley breeders to combat the most devastating root pathogens of the dryland barley production. Direct seeding or conservation tillage are the preferred management practice in the low rainfall areas, where crop residue left on the soil surface provides an ideal environment for the proliferation of root and crown rot pathogens specifically Rhizoctonia solani, R. oryzae, Fusarium culmorum and F. pseudograminearum . Using biotechnology, an endochitinase (ThEn42) gene from a mycotrophic fungus Trichoderma harzianum was introduced in barley genomes, and expressed ectopically under the control of 35S promoter [6,7]. Production of enzyme in barley transformants was determined with the help of a fluorometric assay . The initial transformants identified in Golden Promise background were used to transfer transgene to barley cultivar Baronesse. 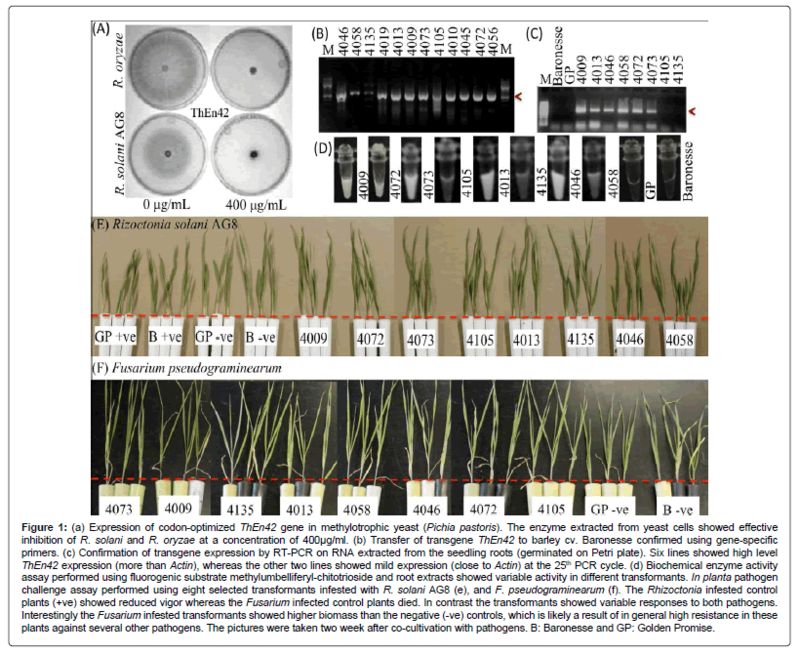 Eight transformants in Baronesse background that showed high expression levels of ThEn42 gene in roots were identified, and recently challenged with root pathogenic fungi in greenhouse (Figure 1). Figure 1: (a) Expression of codon-optimized ThEn42 gene in methylotrophic yeast (Pichia pastoris). The enzyme extracted from yeast cells showed effective inhibition of R. solani and R. oryzae at a concentration of 400μg/ml. (b) Transfer of transgene ThEn42 to barley cv. Baronesse confirmed using gene-specific primers. (c) Confirmation of transgene expression by RT-PCR on RNA extracted from the seedling roots (germinated on Petri plate). Six lines showed high level ThEn42 expression (more than Actin), whereas the other two lines showed mild expression (close to Actin) at the 25th PCR cycle. (d) Biochemical enzyme activity assay performed using fluorogenic substrate methylumbelliferyl-chitotrioside and root extracts showed variable activity in different transformants. In planta pathogen challenge assay performed using eight selected transformants infested with R. solani AG8 (e), and F. pseudograminearum (f). The Rhizoctonia infested control plants (+ve) showed reduced vigor whereas the Fusarium infected control plants died. In contrast the transformants showed variable responses to both pathogens. Interestingly the Fusarium infested transformants showed higher biomass than the negative (-ve) controls, which is likely a result of in general high resistance in these plants against several other pathogens. The pictures were taken two week after co-cultivation with pathogens. B: Baronesse and GP: Golden Promise. iv) Breeding for proanthocyanidin-free grains: In view of reducing the cost of the brewing process and to increase the industrial value of food barley a proanthocyanidin-deficient barley mutant ant-499 in Apex background was deployed to develop a proanthocyanidinfree barley genotype adapted to the US Pacific Northwest (PNW). This characteristic provides barley with an added advantage of being free of proanthocyanidins (condensed tannins) in the seed coat that cause haze formation in beer after refrigeration (by binding to the protein), and give barley porridge a characteristic gray color that makes it unsuitable as baby food and breakfast cereal . Since, feed barley is the preferentially cultivated class of barley in the US PNW a proanthocyanidin-free genotype, 2004NZ151 with high protein content was selected. Results of the multi-location yield trails in the Western Washington showed that 2004NZ151 yields at least 1000 lb/a more than the large acreage varieties (i.e., Bob, Baronesse, and Champion), and exhibits resistance to lodging as well as prevalent races of stripe rust, leaf rust and powdery mildew . In view of its outstanding agronomical performance 2004NZ151 was approved for release under the name Richard for cultivation in the Western Washington. Since, Richard breeds true for ant-499 mutation it will serve as an excellent material to breed for the proanthocyanidin-free malting and food barley cultivars adapted to the US PNW or elsewhere. v) Breeding for increased bioavailability of β-glucans: The low nutritional value of barley for poultry is due to the absence of an intestinal enzyme for efficient depolymerization of (1,3;1,4)-β-d-glucan, the major polysaccharide of the endosperm cell walls. Incomplete digestion of β-glucans leads to high viscosity in the intestine, limited nutrient uptake, decreased growth rate, and unhygienic sticky droppings that adhere to chickens and floors of the production facility. Consequently, the 8 billion broiler chickens produced annually in the United States are primarily raised on corn-soybean diet. If barley is used as feed the diet is supplied with enzymes from Trichoderma. Thus, in order to introduce barley as preferred feed choice for poultry animals, we transformed barley cultivar Golden Promise with the protein-engineered thermostable (1,3;1,4)-β-glucanase from Bacillus to be expressed in endosperm. The feeding experiments with broiler chickens suggested that it is sufficient to add 0.2 g (0.02%) transgenic grains in a kilogram of barley-soybean diet containing 620 g nontransgenic barley, to achieve the nutritive value of the cornsoybean diet . These encouraging results promoted us to breed in the transgene from Golden Promise to the widely cultivated spring feed barley cultivar Baronesse. Successful transfer of the β-glucanase gene from Golden Promise to Baronesse was confirmed using the constructspecific primers , and enzyme activity in grains of selected genotypes will be determined using the Megazyme biochemical assay. This project is supported by the funding from the State of Washington grant WNP00251 and Washington Grain Commission grant 13C-3019-3590. Rustgi S (2013) Bringing barley back in crop rotation by breeding for imidazolinone resistance. Med Aromat Plants 2: e148. Ullrich SE (2011) Barley: Production, improvement, and uses. Wiley-Blackwell. Lee H, Rustgi S, Kumar N, Burke I, Yenish JP, et al. (2011) Single nucleotide mutation in the barley acetohydroxy acid synthase (AHAS) gene confers resistance to imidazolinone herbicides. Proc Natl Acad Sci U S A 108: 8909-8913. Rustgi S, Matanguihan J, Mejías JH, Gemini R, Brew-Appiah RA, et al. (2014) Assessment of genetic diversity among barley cultivars and breeding lines adapted to the US Pacific Northwest, and its implications in breeding barley for imidazolinone-resistance. PLoS One 9: e100998. Wen S, Wen N, Pang J, Langen G, Brew-Appiah RA, et al. (2012) Structural genes of wheat and barley 5-methylcytosine DNA glycosylases and their potential applications for human health. Proc Natl Acad Sci USA 109: 20543-20548. Wu YC, Von Wettstein D, Kannangara CG, Nirmala J, Cook RJ (2006) Growth inhibition of the cereal root pathogens Rhizoctonia solani AG8, R. oryzae and Gaeumannomyces graminis var. tritici by a recombinant endochitinase from Trichoderma harzianum. Biocontrol Sci Technol 16: 631-646. Kogel KH, Voll LM, Schäfer P, Jansen C, Wu Y, et al. (2010) Transcriptome and metabolome profiling of field-grown transgenic barley lack induced differences but show cultivar-specific variances. Proc Natl Acad Sci USA 107: 6198- 6203. Von Wettstein D (2007) From analysis of mutants to genetic engineering. Annu Rev Plant Biol 58: 1-19. Rustgi S, Von Wettstein D, Reisenauer P, Ankrah N, Guy S, et al. (2014) Richard (2004NZ151): A Potential Feed Barley Variety for Western Washington. In: Small Grains Field Day Abstract book, Mt. Vernon, WA.